UPDATED: Mon., Dec. 11, 2017, 11:55 p.m.
About 150 protesters gathered Monday afternoon in downtown Spokane to denounce Republican tax reform proposals moving through Congress. All In For Washington, Greater Spokane Progress and the Peace & Justice Action League of Spokane organized the event. 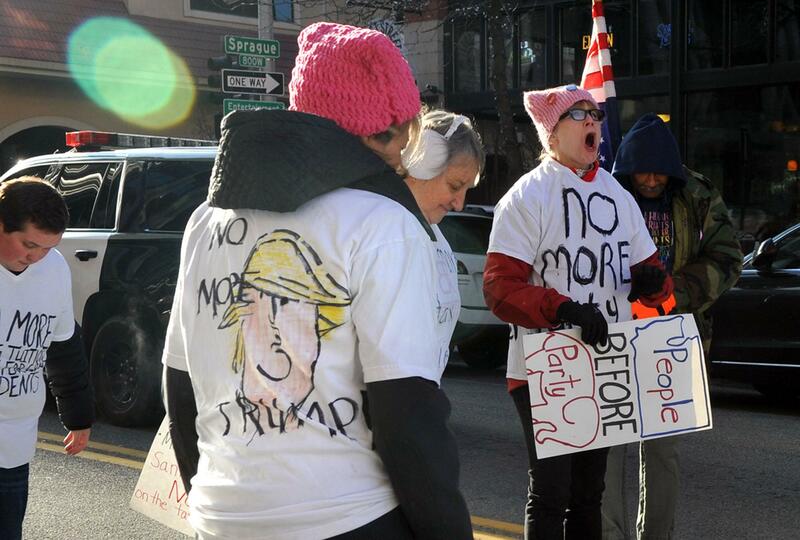 Protesters marched from the Thomas S. Foley United States Courthouse to the local office of U.S. Rep. Cathy McMorris Rodgers on Post Street. Spokane resident Claire Rudolf Murphy, who participated in the protest, said she is appalled at the tax bill because it benefits corporations and wealthy individuals, while middle-class families and access to health care suffer as a result. Different versions of the Tax Cuts and Jobs Act passed the Senate on Dec. 2 and the House on Nov. 16. No Democrats have voted for it. Republicans say their tax proposals will provide tax relief to most people, not just the rich. They argue that it would stimulate the economy as tax cuts free up money that can be spent or used to hire people. The Senate’s tax reform bill would repeal the individual mandate for the Affordable Care Act, which would remove the penalty for individuals that don’t have health insurance, but it could cause insurance premiums to increase. The House-passed version would tax tuition waivers, which would be considered as income. McMorris Rodgers, a member of the Republican leadership team in the House, voted in favor of the House bill, but has said she would prefer that a final version not include the provision to tax tuition waivers. Under the Senate-passed bill, education credits such as the American Opportunity Tax Credit and the tuition and fees deduction would remain unchanged and not be taxed. Priyanka Bushana, a Neuroscience graduate student at Washington State University, said she chose to pursue a degree at WSU because the school was able to offer a good education and provide a stipend that pays for her living expenses. A congressional conference committee will meet Wednesday to begin to reconcile differences between the House and Senate tax bills. Published: Dec. 11, 2017, 5:15 p.m. Updated: Dec. 11, 2017, 11:55 p.m.